I love how flowering trees bloom before the leaves come back. The stark contrast between dark spindly branches and bright fragile blossoms is stunning, even inspiring. 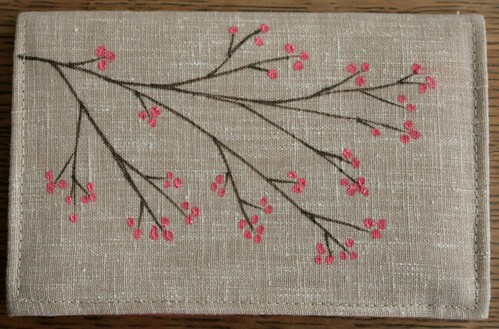 I brought home some tan cotton fabric the other day and decided it was an excellent candidate for embellishment. Using my mocha Sharpie (have you discovered the Couleurs Cafe Sharpie pens yet? ), I drew some branches. 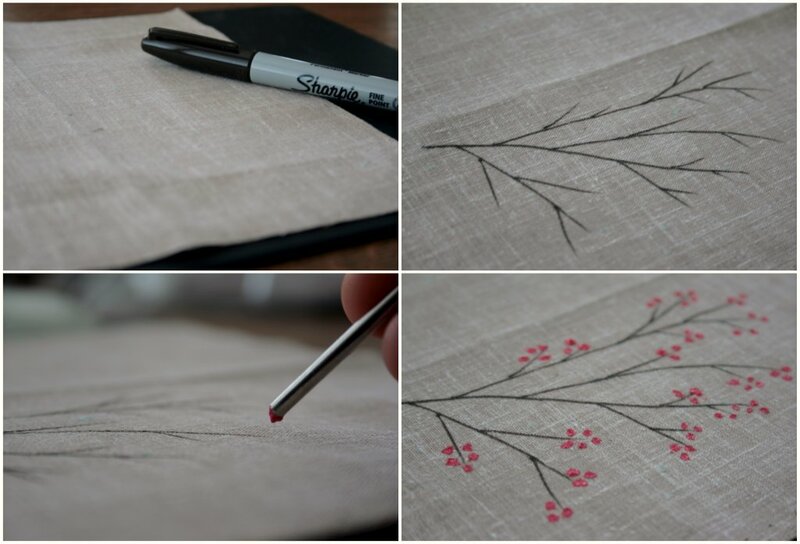 Then I mixed up an obnoxious shade of pink using red and white textile paints. With the end of a small crochet hook I dabbed on some blossoms. A few seams later I had a little pouch for my index cards. I love index cards. They take me right back to elementary school when I had to write my first research paper and my teacher instructed the class to write down all of our facts on index cards, then arrange them in a logical order before writing our report. Ah, the days before cut and paste. 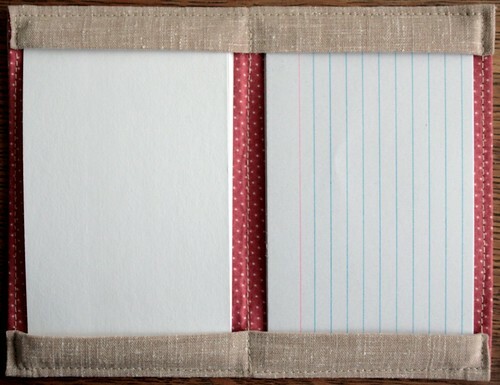 I made a few extra index card holders and put them in the shop. Just in case you have to do some research and write a report, or write a note to a friend, or make a little sketch of the project floating through your mind, or just because you love bright pink blossoms on an otherwise bare branch. That is just stunning. I love how the fabrics and your art all come together. You're so creative. Have you ever read Anne Lamott's chapter on index cards in Bird By Bird? She's a huge fan, and writes about how she jots down notes on index cards to inspire her writing. She never leaves home without one, and says she likes index cards because she can fold one in half and put it in her pocket when she goes out without looking "bulky". Hee hee. I suppose your holder stuck in a back pocket might make you look a little bulky, but it would still be gorgeous. lovely - I too am so drawn too branches and blossoms - I am in love with my flowering peach tree at the moment - I think the flowers this time of year are the main reason I keep this old tree. Index cards are wonderful - especially old and yellowed ones. I have a little stash of these tucked away just for me. have a nice rest of this sunny cool day! this is random, but i love your site and i just realized it is on blogger...the same as me. HOW? did you do it all custom with code or something? I LOVE that there are links at the top for other things. I want that under my "hand made header" ;) but don't know how. And i have big photos but not as big as yours! HOW? I love it. if it's complex and code-y tech-y chaos, nothing you can say will help me. :) if there is something simpler that i am missing, would you mind terribly telling me HOW? ;) I love it. Lovely. What a creative idea. love the photos you've been taking lately too. Not to be too schmaltzy, Molly, but sometimes your photos are so beautiful they almost make me cry. Like the flowering quince up top. I saw all the colored Sharpies at Office Depot last week and just KNEW there had to be some creative purpose for them. You found it! Love the design AND practicality of the index card holder. I looooooove index cards too!!! Such possibility. Your blog is so great--one of my greatest hits! ah yes. My fondest index card memories are of studying for an art history exam in college, a sketch of a painting on the front, artist and important facts on back. Good times. I should get into them again, I think. There are no blossoms here yet, but birds chirping loudly, sunshine and buds that promise blossoms soon. You are so talented! that is really beautiful, molly. the tree and the card holder. 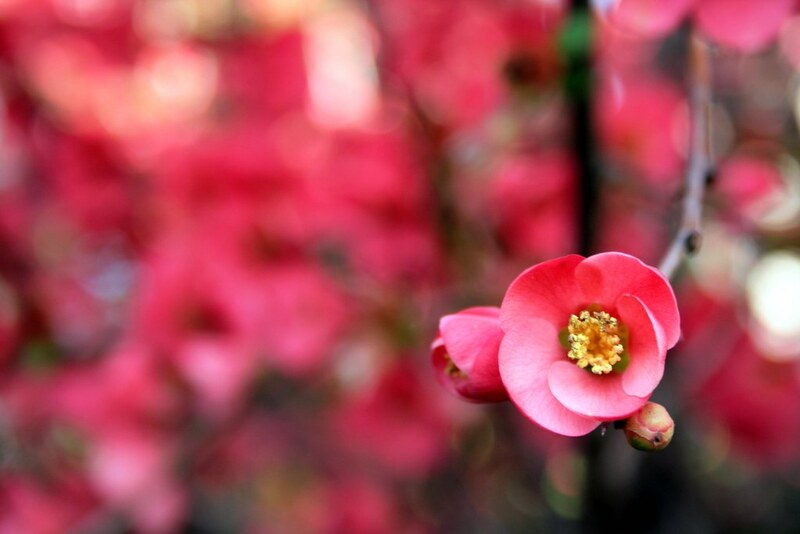 My parents have a flowering Quince and I just love it. Your drawing is amazingly pretty!!!! I am totally insane and unreasonable when it comes to my love for Sharpies. Don't have those colors yet. Probably will before tomorrow. Sigh. One of my great complaints about the world is the fact that they only make the extra fine point Sharpies in four colors. What's UP with that??? Ha... the index cards for research papers... One of the things that I too loved from my school days! This is just lovely Molly! My friend has a quince tree... what do you do with them? Index cards are perfect for planning birthday parties, making shopping lists, sketching things on vacation. Prabably more, but those are my favorites. Beautiful!!! And actually much handier than a notebook. Seriously? That first shot. is. so. dang. cool. beautiful! i love quince so much too! beautiful photo and I love that obnoxious shade of pink! Those turned out super cute. Thanks for the inspiration, I big time plagiarized your idea, thanks for helping me to get out of my rut!